Strikedeck’s QBR Powerpoint Template was made to be your quick solution for amazing slides in your upcoming Quarterly Business Review. Customer QBRs are a fantastic opportunity to showcase how your business has been adding value to the customer. Giving executives a good impression, especially in the first meeting, can go a long way in reducing the chances for churn. Our template gives you a great range of slides and layouts that you can use to create and customize the perfect deck. Don’t have Microsoft PowerPoint? No problem! In the confirmation email, you will receive a link to access a Google Slides version of the template. Edit everything from within Google Drive, and even collaborate with your colleagues. Fill out the form below to get your QBR Powerpoint Template! First off, you’ll find the attendees list. Use this slide to introduce all key persons who will attending the meeting, so everyone knows who’s there. If you have more than six people to add, simply create a new slide and select the “Team/Attendees” layout by right-clicking the slide on the left panel. Next, there are tasks slides. These slides are made to showcase the exact tasks that your company has worked on, or is working on for the customer. List up to three tasks, milestones, or issues per slide, with the person-in-charge, the start and end dates, notes, and the progress of each task. To add more tasks, duplicate one of the pre-made slides, and edit the orange line to fill or reduce the progress bar. Use the timeline slide to showcase the sequence in which tasks were started or completed, when key events have occurred, or what you plan to accomplish in the future. Edit the length of the orange line and color of the dots to show which events are in the past, and which are planned for the future. Use the “World Map” or “US Map” layouts to represent data based on geographical locations. Simply copy and paste the circles to add data for more regions. Use our mockup slides to showcase new product features and explain how to use of them. We have created laptop, tablet, and smartphone layouts to showcase features on whichever platform they may appear in. To edit the screen image, click on the current image, delete it, and replace it with an image of your choice. be used to reflect product usage and product ratings. To customize the graphs with your own metrics, right-click the graph and select “Edit Data in Excel”. Head back to the top of the page & fill out the form to get your free copy of the QBR Powerpoint Template now! In the Zip folder, you will find five scenarios for how you can use Strikedeck’s QBR Powerpoint Template. Certain QBRs will require metrics-focused presentation slides. These slides would be suitable for customers who have a specific set of KPIs. Show them exactly how well they’ve performed in the last quarter, which goals they’ve managed to hit, and which they’ve fallen short of. Consider comparing their performance with your average customer, and show them how they’ve outperformed the others, or how they can improve their statistics to eventually exceed the average. Don’t forget to discuss future goals and metrics-based milestones, along with which tasks need to be completed to achieve those milestones. Other QBRs will require tasks-focused presentation slides. 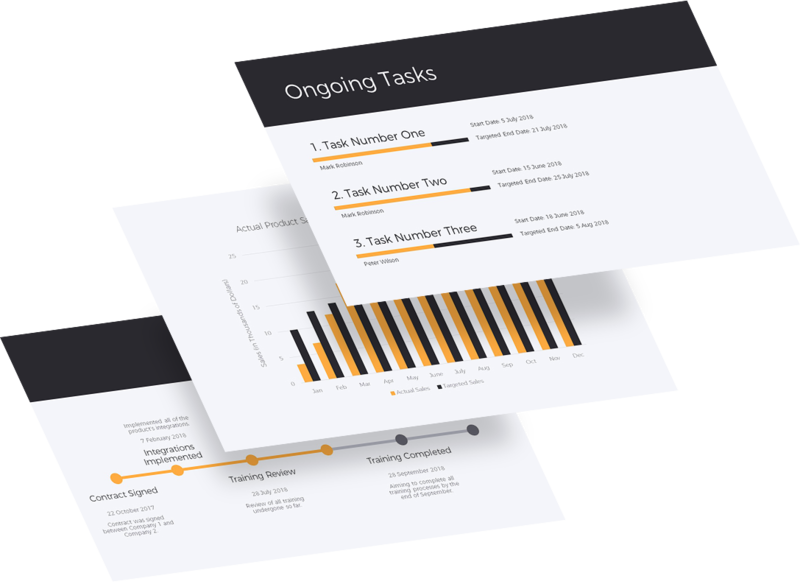 These slides would be suitable for customers who want to know the exact progress of each task that your company is working on. Remember to include all completed tasks, ongoing tasks, and even future tasks that you have planned. Use the sliders in each task slide to show them the progress on each task. You could consider adding a timeline slide to give an overview of all past, ongoing, and future tasks. It may be important for you to have an introductory QBR during the onboarding stage. List and clarify all success criteria with the customer, so you are clear on exactly what their company is looking to achieve. Go through all main product features, and even include best practices, so that they will be able to make the most out of your platform. At the end of the presentation, give them a list of all upcoming milestones and tasks that will help them attain their specific goals. When releasing a new product/feature, it may be good idea to cover it in a QBR. Tell the customer which features have been added, how to use them, and how they can benefit from the use of these new features. 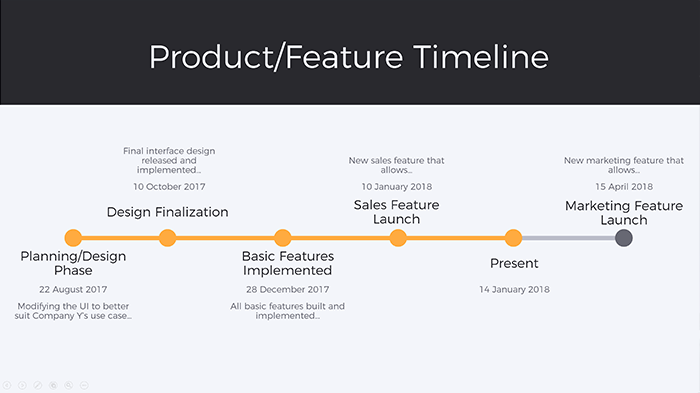 After going through the new additions, let them know about the other features on the product roadmap, and ask them for suggestions. When a key stakeholder leaves or is replaced, it may be time to arrange for a QBR to introduce the new stakeholder to your company’s platform. In these kinds of QBRs, use a timeline to give an overview of all the projects that your company has worked on in the past, show them the milestones that have already been achieved, and which tasks and goals are currently ongoing or are planned for the future. Give the new stakeholder a great first impression of your platform, and get them excited about working with you! Remember, these are just examples of how you could use our QBR template. Every use case is unique and will require a bit of tweaking here and there. So don’t be afraid to get creative, change it and edit it to suit your own use case. We just hope we’ve provided a great canvas for you to work off. All the best for your upcoming QBR and may you exceed expectations!